Splatterhouse is getting a bloody, modern remake later this month, but that's a gamble. 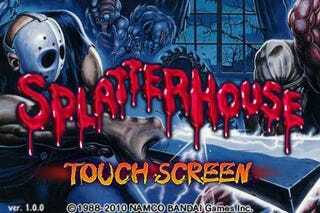 The classic 1988 arcade Splatterhouse? We all know that's a fantastic game, and now you can play it on your phone. I'm not just talking to you iPhone owners out there, Namco says they're bringing the 88 title to more than 300 mobile carriers in the U.S. and Europe next week. The game will be available for the iPhone, JAVA, BREW, RIM and Windows Mobile phones. The iPhone version, seen in the screenshots below, will run you $2.99 and includes a Splatter Rush Mode. The price for the other versions, shown the video below, will vary by wireless carrier.